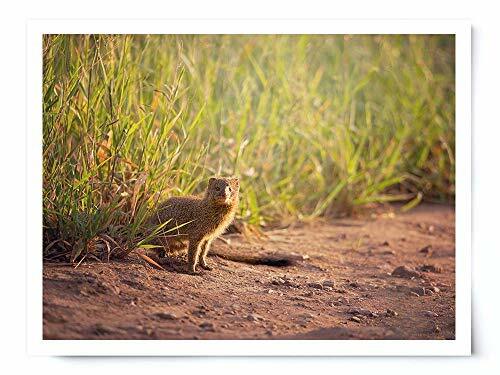 Mongoose - Wildlife Photograph Animal Picture Home Decor Wall Nature Print - Variety of Size Available by Whimsical Wild Artwork at Animal Backgrounds. Hurry! Limited time offer. Offer valid only while supplies last. This photograph features a single mongoose in the golden morning light. This is an unframed archival Giclée print by photographer Lauren Pretorius. This photograph features a single mongoose in the golden morning light. This is an unframed archival Giclée print by photographer Lauren Pretorius. Print Sizes: All prints come in a variety of sizes listed in the drop down menu. Please note that there may be slight cropping of the negative space on the design to accommodate for different size ratios. *Sizes Larger than 16" x 20" will not have a white border. Paper: Printed on archival heavy weight white luster paper with fade resistant inks with an additional 1/2" white border on the edges for framing. Shipping: Prints are shipped flat in a bio-degradable sleeve with fiber boards. Larger sizes are rolled, sleeved and shipped in a sturdy tube. Every print is carefully packaged to ensure a safe arrival on your door step. If you have any questions about this product by Whimsical Wild Artwork, contact us by completing and submitting the form below. If you are looking for a specif part number, please include it with your message.